'Whilst most patients who will attend The Dental Centre Bedford simply need general dental care or a minor filling, it is always good to know that expert care is on hand when more advanced treatment is necessary. 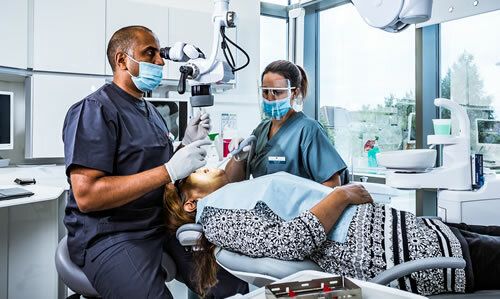 Specialist dental treatments may mean the difference between saving a tooth or having to extract it, treating gum disease or correcting significantly misaligned teeth. In fact there are a number of dental specialisms which address all aspects of complex dental care. At The Dental Centre Bedford, we are pleased to offer specialist services in the following areas. Endodontics is focussed on the internal structure of the tooth. When the soft material in the roots of a tooth, where blood vessels and nerves are stored, becomes infected, the only solution is to remove it, as failure to do so will likely result in the tooth being extracted. To repair the tooth and relieve the pain associated with root infections, our endodontist will use a procedure known as “root canal” therapy. 'With the aid of an operating microscope a small hole is created through the biting surface of the tooth to access the canals and remove the infected tissue. The hollow canals are then filled and a dental crown usually fitted to provide additional strength to the tooth. The procedure may appear to be complex, but in most cases this can be completed in one visit. Periodontics is concerned with the soft tissue surrounding the teeth; predominantly the gums. With gum disease being one of the leading causes of tooth loss in the UK, helping patients to have healthy gums is essential. Whilst many cases of gum disease can be managed with preventative care including thorough cleaning; once it becomes advanced, more invasive treatment, sometimes called ‘root planing’ may be necessary to remove hardened bacteria (tartar) from the teeth and below the gum line. Failure to treat gum disease may well result in tooth loss due to deterioration of the bone which holds the teeth in place. Prosthodontics is concerned with the replacement of teeth and related areas of the mouth by artificial means. This includes well known methods such as dentures, bridges and crowns. Increasingly though, prosthodontics is also incorporating the use of dental implants to replace missing teeth. These are titanium rods which are placed into the jawbone and allowed to fuse with the bone to form an artificial tooth root. A dental crown is then attached to complete the strongest and most natural method of tooth replacement currently available. Should you require any of these treatments, you can be sure that our experienced and highly skilled specialist dental team will take very good care of you.